The year is 2011, a chain of natural disasters raise fears of doomsday. Terrifying stories unfold about nuclear accidents that were triggered by natural disasters. 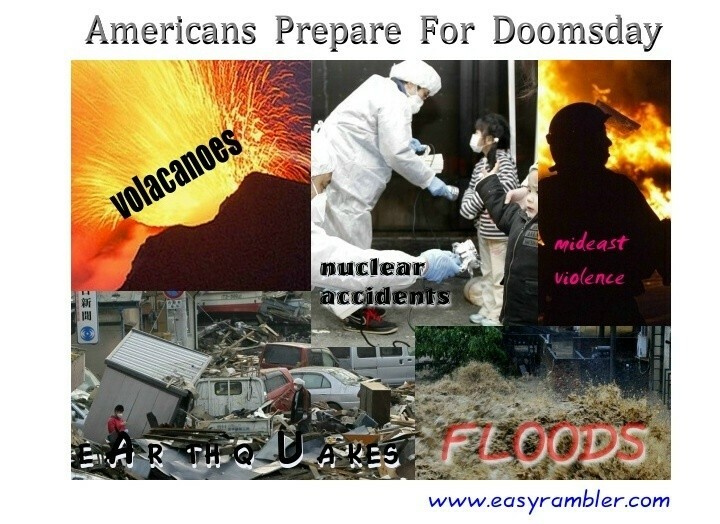 Many Americans believe that things can only get worse, nuclear catastrophes, global violence and anarchy, large magnitude earthquakes causing huge tidal waves and much more to come. This is not a hollywood movie script, it is something that is actually happening to our planet. How much more can this earth take? Is it coming to an end? Many people believe that the end is near. Some are so scared that they are spending thousands of dollars to buy some peace of mind. Here is the actual scenario that is unfolding in America. The following narration has been based on true reports published by reputed agencies that include CNN. Easy rambler follows the trail and realizes why the Americans fear that the worst is coming soon. March 2011 and businesses report an increase in sales but, the consumer confidence level is quite low due to the slagging American economy. So what is the increased sales for, we get the facts for you. The terrible earthquake in Japan has caused untold damage, it has also given rise to two other calamities. The earthquake triggered huge tidal waves also referred to as a tsunami. Cars, buses, boats and people were washed away, injured and dead lay everywhere. Islands were washed out and almost all inhabitants were injured or dead. The problems did not end there, the earthquake damaged a nuclear reactor which in turn caused nuclear contamination of the air, water and food stocks. Some American businesses have been quick to cash in on the fears of people. Many believe that the world could come to an abrupt end at least, for most of mankind. Some hope to survive and are spending on things like doomsday bunkers. Northwest Shelter Systems a U.S based company sells doomsday bunkers that can keep people safe from many natural and man made disasters. The price of these bunkers ranges from 20,000 U.S dollars to more than 10 million U.S$. The company first reported a jump in sales as the violence in the Mideast spread, the Japanese triple tragedy has helped sales too - sales have jumped by over 60%. Scared Americans are paying hard cash for such facilities, they hope to live even if everyone else is badly affected or dies! Another manufacturer Undergroundbombshelter.com has it's version of survival equipment. This company sells portable bomb shelters and underground bunkers. These can withstand bomb attacks and some are equipped to keep a person safe from nuclear contamination. The price of these bunkers are a little below 10,000 U.S$ and are supposed to keep you safe from bombs, nuclear contamination and even biological warfare. The company has reported that it's weekly sales numbers were almost as high as what it sold each month. The company that is really serious about making huge money playing on peoples fears is Vivos. This company has doomsday bunkers for rent that can hold around 200 people. The earthquake and the resulting nuclear accident in Japan pushed up buyer interest in the Vivos facilities by more than 1,000%. People pay a 5,000 U.S$ deposit to reserve a place for themselves. Some of these bunkers are in the construction stage but will be completed soon. Still on Vivos is another mind boggling project, this is a massive site in Nebraska. The company is building a 135,000 acre safe place under the Nebraska grasslands. The facility can withstand a 50 mega ton blast, something that will come in handy in case of a full scale war. It can house almost 1,000 people for as long as a year. The entire premises is being built with comfort and safety in mind. The facilities include a medical center, a bakery, kitchens, a place to keep pets (animals and birds), pool tables and even a well stocked wine cellar. Another interesting place in this premises would be a detention center to hold anyone who might get agitated or violent. The plan also includes a 350 feet high watch tower, this is for the adventurous people who want to get a glimpse of the tragedy happening around the place. The above information is true though we hope that, the fears of these scared Americans will never actually materialize into something real. Recent American actions in the Afghanistan and Iraqi regions has also raised the possibility of terror attacks. These can come directly in the form of bombings or indirectly in the form of water contamination or even attacks on critical nuclear and defence facilities. Easyrambler would love to hear your comments on this article, easyrambler@rocketmail.com is where you can email us.